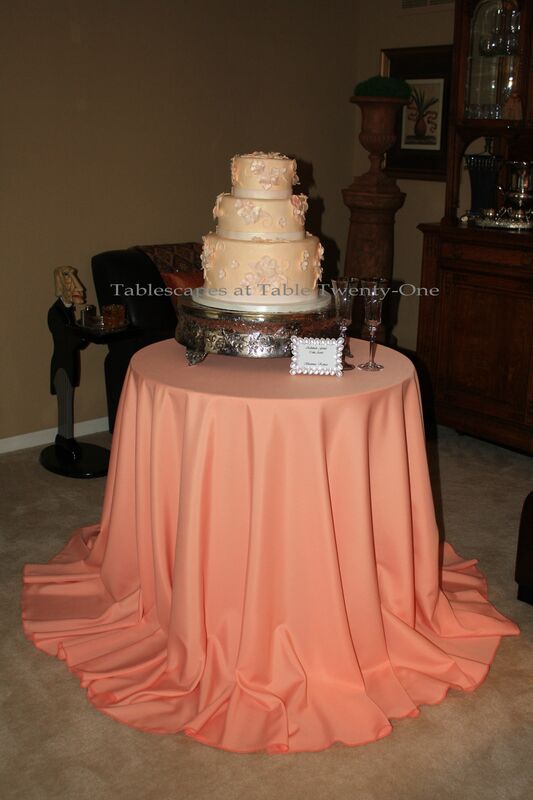 To give a cake table or any table a special little oomph, use a linen about 18″ larger than what you usually would for a floor-length, and pleat fan the bottom to resemble the hem of a flirty short skirt or dramatic evening gown. I got this idea when one of my students, Marie, came to class in a great little red skirt with a similar hemline. It adds a lot of instant character to the table and tends to keep people back just a bit so curious hands don’t make their way into the frosting! To add even more interest, consider adding a smattering of flower petals or gemstones. The 108″ peach linen used on this 30″ round table is from Linen Tablecloth. The toasting flutes are Mikasa from the “Jamestown Platinum” collection. 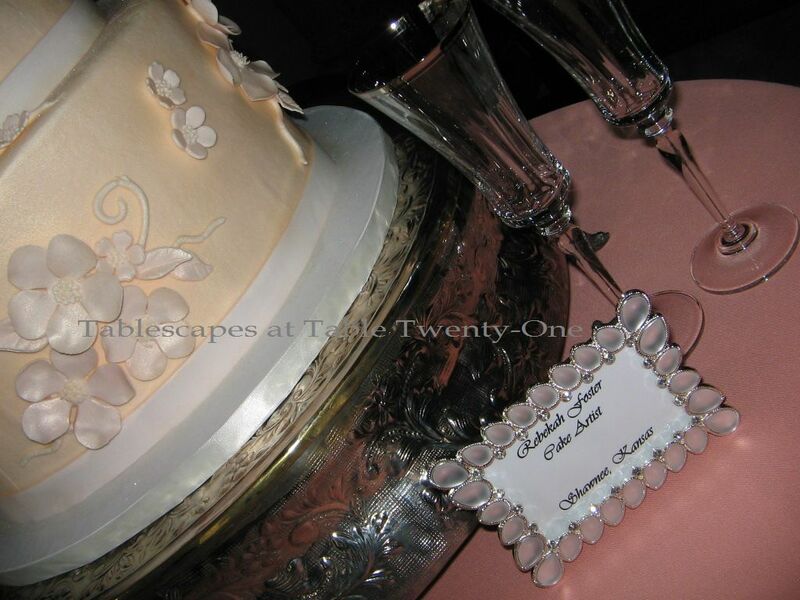 The silver scrolled cake plateau and gemstone-studded frame are from my private inventory, vestiges of my days as a purveyor of fine special occasion rentals. I’m linking up with Kathleen for “Let’s Dish!” this Wednesday. Please join us anytime after 6:00 p.m. CDT for tips on all things dishes and tabletop! How beautiful! 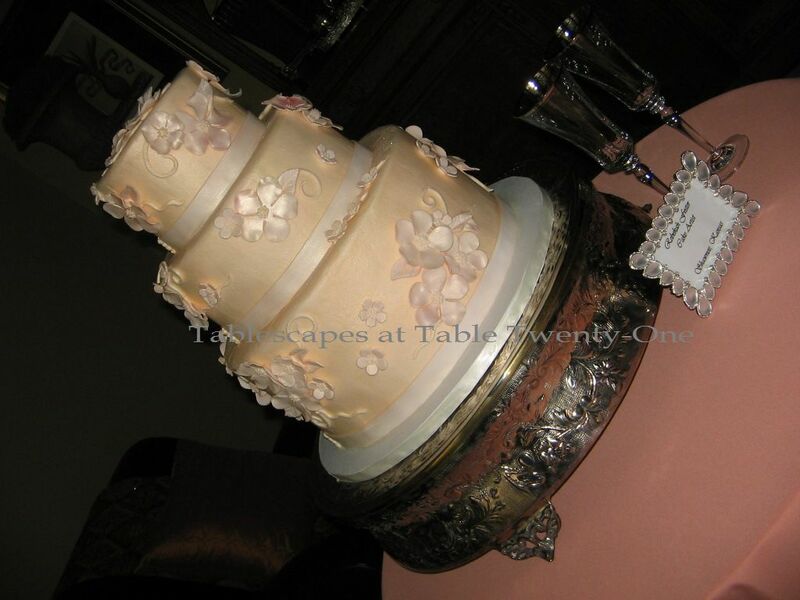 The cake is so pretty with the pearlized flowers, love the color. Great idea on the table skirt. YUM ! It glows with the soft colors. Gorgeous table!…Sure your students loved it!…I want to be a student!! I love it. I wish I ha known you when I got married!! Love those toasting flutes. You have really created a wonderful setting !!! I love the flirty skirt idea, Alycia. All the peachy colors of this table are gorgeous! Very nice. What a lovely cake and it looks great with the peach table! 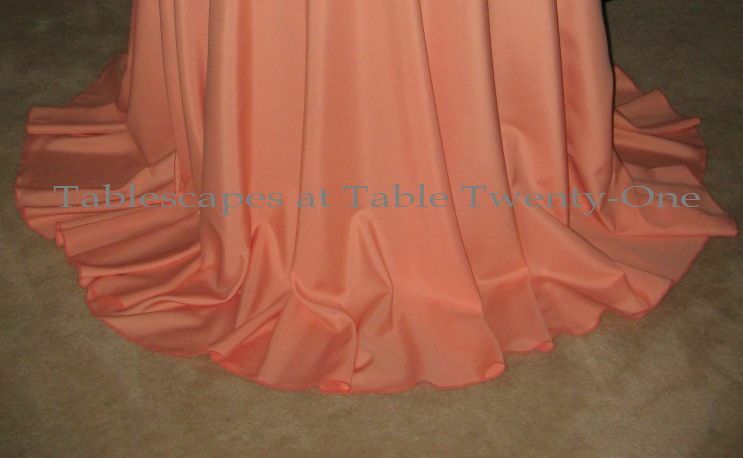 LOVE the peach flirty skirt on the table! Curious minds would like to know – how many times did you rent that beautiful cake plateau? It’s gorgeous! I really love the way the skirt flairs out like that! It’s elegant. I’m putting this in my “future mother-of-the-bride” idea file. I’m a dreamer, ya know! Love the flirty table skirt! That cake looks amazing as well! Hope your class is going great!! Have a blessed rest of the week! I like the way the tablecloth drapes. The cake looks fabulous! Simple and elegant. Oh, how elegant…beautiful color, too! Beautiful cake. I’m off to see more of her creations. Alycia, that is one beautiful tablecloth and the cake is a masterpiece. So very elegant. I love how flirty the tablecloth is. It is high drama. I bet you are having a blast with your class. Enjoy your week-end. Sorry I am late! I thought the Derby table was your entry. Your table skirt is so flirty! Love how it was draped on the floor! Its gorgeous!